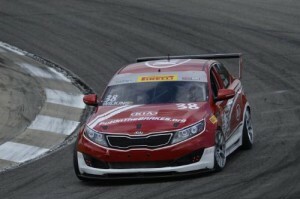 Kia Racing showcased championship-caliber grit and determination in rounds 13 and 14 of the Pirelli World Challenge (PWC) at Sonoma Raceway, keeping Kia atop the Grand Touring Sport (GTS) Manufacturer Championship with a pair of hard-fought, top-five finishes. With only two races remaining in the 16-race PWC season, Kia currently leads the title fight by an eight-point margin. Among rivals Ford, Chevrolet, Porsche, Nissan and Aston Martin, only Kia and Ford are mathematically still in the hunt. Meanwhile, Kia Racing pilot Mark Wilkins’ pair of fourth-place finishes at Sonoma set up a dramatic three-way battle for the GTS Driver Championship among Kia’s Wilkins, Lawson Aschenbach (Camaro) and Jack Baldwin (Porsche), which will be decided at the season finale doubleheader at Miller Motorsports Park September 12-13. Located just outside Salt Lake City in Tooele, Utah, Miller Motorsports Park features a fast, free-flowing layout that has been a good fit for Kia’s turbocharged Optimas in the past. In Kia Racing’s rookie PWC season in 2012, the team scored its first podium finishes in the series at Miller with a memorable second and third-place result. NBC Sports Network will air the televised coverage of rounds 13 and 14 from Sonoma Raceway on Saturday, August 30, at 1:00 p.m. ET. Fans can also watch live streaming online at www.world-challengetv.com, and race fans can keep up-to-date with the team via the Kia Racing Facebook page at www.facebook.com/kiaracing and by following along on Twitter: @KiaRacing.